So we're back. Jake is my new hero, what a brave little boy. All went virtually to plan but we had to wait an hour and a half on Wednesday just so we could have the 5 minute check over by the doctor to make sure Jake was a.o.k for the operation. This was caused by the fact that Jake's name was at various times spelt by morons who were employed to ensure the NHS is complying with equal opportunity policies. Jake 'Fernig' perhaps seems a forgivable enough error when you consider g's proximity to e on a keyboard but not so forgivable when you consider major facial surgery. What if there had been a Jake Fernig due for a completely different operation? The poor lad would have gone in for an eye test and come out with a repair to a non-existent cleft! Next he was Duke Barney!?!?!?! WTF? My God, I'm all for equality but you'd think someone might double check...surely the base level for all equal opportunities type policy ought to be basic ability to listen, read and write. How is it 'equal' when people who are plainly, idiots are incapable of doing the actual job, get the job over normally educated people who could do the job standing on their heads? Either way, the operation went ahead, albeit two and half hours late. Why nothing is ever on time when it's been in the diary for months I'll never know. 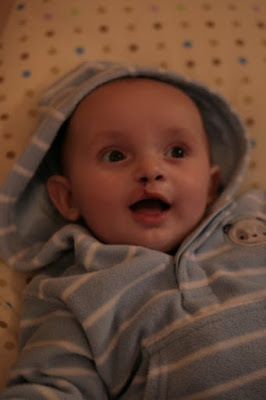 Also Jake was the only baby and the only one there who'd never had an operation before. We had to starve him from 6am and to his enormous credit he went all the way to 2.30pm with nothing more than some low level grumbles. One of the people waiting was a 15 year old boy in for a lip and nose revision and the other, coincidentally, was a young girl from Guildford, in for palate hole and lip revision. Both of these cases could have understood that the baby would have to take priority as they'd had operations before and it's the waiting more than anything else which is the hardest to cope with. A note on these other cases. Piet had told us that in 500 operations only two had revisions, yet here were two people in for revisions! What are the chances?! I think that a lot of what we had been told was to keep us calm before the event, knowing that we'd just cope afterwards. So, that's my only complaint dealt with, the rest is nothing but praise and admiration. Firstly, the hospital was incredible. Only a few years old, super modern, brightly decorated, welcoming and spotlessly clean. MRSA would be scared to step foot in the Evelina children's hospital; we were very impressed. The nurses were fantastic, so kind and attentive. I guess they get huge job satisfaction working with babies but still they work 12 hour shifts on sod all money and keep a smile on their faces at all times. They were great and put as much at ease as possible. So the hour finally came when it was time to take Jake down to the theatre and it was the moment we were dreading most. Saying goodbye to him and holding him as he was given the gas and air was horrendous; he had a look on his face which just said 'why?'. It occurred to me that he'd never asked for any of this. He thought everything was fine, he was eating and sleeping well, socialising, learning, developing etc, etc and then we go and sedate him and have him operated on. Obviously all for his own benefit but you try to rationalise with an 18 week old baby! Poor bloke...it was an emotional time but thankfully the anaesthetist ushered out quite quickly so we didn't have much time to dwell and went for a long walk and a drink while we waited. Time waiting to go into the recovery unit dragged for an eternity but eventually it came. We walked down with nervous anticipation, worried that Jake would be changed and in pain. One of the nurses was cuddling him and he looked bewildered and groggy from the morphine. It was both a shock and not a shock to see him. I knew he'd look different but not that different but what I found upsetting was that the old Jake was gone, vanished into history and it seemed like that's what we wanted. Actually we love the old Jake and we kind of wanted him back. 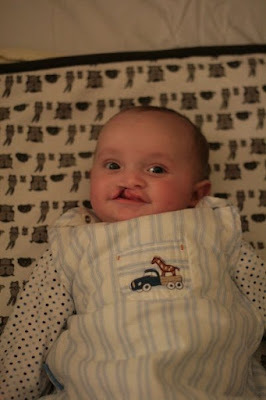 Because of his lip his smile was so much bigger than other babies and to us that made him a much happier baby. His new smile is smaller but that's because his new mouth is smaller so therefore it makes him not as happy? No, obviously not, but it all goes through your mind. Within an hour we were back on the ward and staring at him in all the amazement that we experienced four months ago when he was born...it felt like we were back to square one. Having just got rid of the kid gloves it felt like we needed them again and had to be so much more gentle with him. It's really just because he looked so pissed off and dopey that we felt that. The most upsetting thing is that he wasn't himself and there was no way we'd be getting the smile (old or new version) that we were starting to get on demand. As, predicted I got to sleep on the floor which made me feel like I'd been worked over by a baseball bat but did manage a few hours. Clare got up to feed Jake at 5am and I snuck into her pull down bed and fell into a deep sleep for a couple of hours and this saved me. Then by 2pm on Friday we were home. We still cannot believe how successful the operation was and what a massive difference a day makes. The new lip and nose look great and it's just the biggest relief that this part of it is over. The operation includes some repair work to the front of the hard palate (the bit your tongue touches when you use the letter T or D) so this acts as scaffolding for the rest of the palate repair in May or thereabouts. We're so grateful to the whole team and efficient process that made it as bearable as possible and feel much more assured about the second operation now we've been through this one. Here are some photos of our fantastic brave boy. Hello! 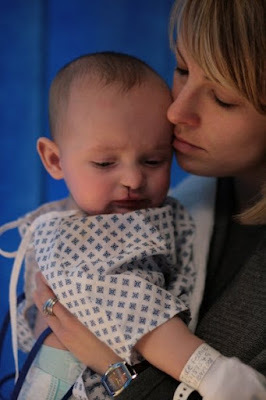 I came across your blog while I was doing some cleft research. It looks as though your boy has just had his lip surgery. He looks great! 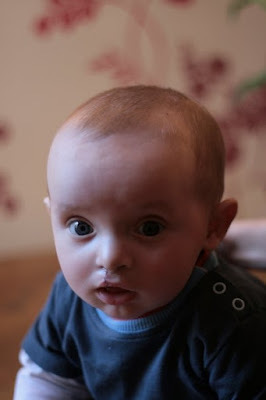 My baby is is now several months post-op with his lip surgery. He is healing very well.